Writer/director Woody Allen delivers a powerful, "searing adult drama" (Leonard Maltin) examining the life of an accomplished philosophy professor teetering on the brink of self-understanding. Boasting a superb cast led by Gena Rowlands, Mia Farrow, Ian Holm and Gene Hackman, Another Woman is Allen's 17th triumphant film. Stylistically rich and technically expert, the film layers past and present, dialogue and narration, reality and metaphor, to achieve a "lucidity and compassion of an order virtually unknown in American movies" (Time Magazine). Intelligent, accomplished and happily married, Marion (Rowlands) considers her life fulfilling…until a chance encounter with a troubled stranger (Farrow) offers her a brief but piercing glimpse at her inner emptiness. Drifting in a loveless marriage and denying her feelings for another man (Hackman), Marion is shocked when she accidentally learns of her husbands (Holm) infidelity. Taking this as a sign to change her life, Marion confronts the true depth of her own emotional hunger…and the frightening intensity of a passion she has ignored for too long. DVD: Widescreen 1.85:1/16x9; audio English Digital Mono, Spanish & French Digital Mono; subtitles Spanish, French; closed-captioned; single sided - single layered; 16 chapters; rated PG; 81 min. ; $19.98; street date 6/5/01. Supplements: Collectible Booklet; Original Theatrical Trailer. If this DVD thing doesn’t pan out, I figure I can pursue a career as the writer of those movie synopsis blurbs you see in TV Guide. As a test run, here’s my summary of Woody Allen’s 1988 drama called Another Woman: “Successful upper-middle-class woman has mid-life crisis, reevaluates her decisions and priorities, bores audience”. With AW, Allen continued his attempts to distance himself from his earlier comedic successes. To a certain degree, I admire Allen’s willingness to bite the hand that fed him. Too many artists are content to simply regurgitate the same old stuff over the years, and it’s positive to see someone try to broaden his horizons. However, admiration doesn’t automatically mean that I’ll like the results. I thought AW’s dramatic predecessors - 1978’s Interiors and 1987’s September - were absolutely dreadful. While AW manages to be more compelling than either of those duds, it still suffers from a lot of flaws that make it a failure. On the surface, Marion (Gena Rowlands) seems to have a terrific life. She’s a prominent and respected philosophy professor with what appears to be a happy marriage and a positive social life. To help her write a new book, she rents an apartment away from home so she can be alone. While there, therapy sessions from a neighboring office filter in through the heating grate. Although Marion tries not to eavesdrop, she gradually becomes fascinated by these discussions of a pregnant woman’s apparently empty life, and what she overhears forces her to reevaluate her own existence. It shouldn’t come as much of a surprise that when Marion digs beneath the surface, she discovers that all wasn’t as well as it seemed. (Hey, it wouldn’t be much of a movie if she examined herself and quickly said “everything’s a-ok!”) Marion tries to reconnect with family, friends and lovers as she delves into her own past. While I openly admit that I’m not a huge fan of this kind of introspective, artsy fare, I don’t maintain any true opposition to the genre. When done well, this sort of flick can be thought-provoking and insightful. Unfortunately, in the hands of Allen, Another Woman never becomes very deep or rich, and its revelations seem unremarkable and obvious. Granted, I enjoyed AW much more than I expected, but that was mainly because I watched it immediately after I checked out September. Heck, a root canal would be a welcome relief after the horror that was September, and since AW varied its settings and time periods to a mild degree, it offered a change of pace that seemed somewhat satisfying. However, once the novelty wore off, I soon became tired of the movie’s dreary introspection. Rowlands does a decent job as Marion, but frankly, the character seems like something of a moron. She’s a philosophy professor but she’s never given much thought to her life and relationships? That makes little sense, and the film suffers from this lack of logic. While the story required Marion to be rather unaware of herself, the manner in which her evolution develops seems far-fetched. For Marion to grow, she has to be prodded by connections with others, and many of these require coincidental meetings. She runs into her sister-in-law, an old friend, and a mix of others. When we throw in the happenstance availability of the therapy sessions that prompt her voyage, the whole thing becomes that much more hard to accept. I can’t say that I hated Another Woman. If nothing else, it offers a solid cast. Yeah, I thought they were wasted on this pedestrian character piece, but it’s hard to loathe a picture with Gene Hackman and Ian Holm. Nonetheless, I thought that AW was a drab, lifeless affair that didn’t remotely approach the levels of honesty and introspection it wanted. If you want to watch one of Woody Allen’s dramas, this one’s a better choice than September or Interiors, but it remains an unfulfilling affair. 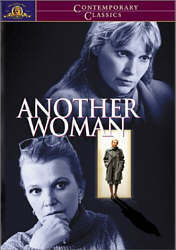 Another Woman appears in an aspect ratio of approximately 1.85:1 on this single-sided, single-layered DVD; the image has been enhanced for 16X9 televisions. After the very attractive picture found in September, I was surprised by the lower quality I saw during AW. While the film wasn’t unwatchable, it presented a problematic image throughout the majority of the film. Sharpness was somewhat erratic. Most of the movie appeared adequately crisp and detailed, but on occasion, the picture became soft and fuzzy. Parts of AW seemed to show a gauzy look that made it seem as though a film were over the camera lens. Again, these concerns weren’t consistent, but I thought the movie as a whole was only decently focused at best, and some parts were hazy and soft. Moiré effects cropped up on occasion, but jagged edges presented no problems. As was the case with September, AW featured a very restricted palette that tended toward flat, earthy tones. However, I thought these were not very well replicated during AW. Hues looked consistently drab and bland throughout the movie - even during daylight exteriors - and similar murkiness also affected black levels. Those tones were often muddy and ill-defined, and they occasionally seemed excessively brown. This meant that shadow detail seemed somewhat weak. Low-light sequences were acceptably visible, but the dreary blacks meant that dim scenes appeared thicker than they should. While I expect that Allen intentionally made the film look a bit lifeless, I find it difficult to believe that he wanted it to look this ugly. Print flaws were often a substantial issue. The movie showed moderate grain at times - though not as heavily as during September - and other issues appeared throughout the flick. The film displayed a fair number of speckles and nicks plus other examples of grit, blotches, small hairs, and general debris. Ultimately, Another Woman offered a fairly unsatisfying visual experience. As with virtually all other Woody Allen films, Another Woman featured only a monaural soundtrack. Frankly, I have no real objections to this choice in regard to movies like AW or September, as these kinds of pieces really wouldn’t benefit from multichannel sound. However, I do expect the monaural audio to be clear and vibrant, which was what made the mix for September work well. While the track for AW still seemed decent, it showed a few problems that made it less successful than I’d like. Not surprisingly, dialogue was by far the most significant aspect of this chatty film. Although lines were fairly distinct and crisp, they displayed mild edginess at times. This didn’t affect intelligibility, but I thought the speech could appear somewhat harsh at times. That trebly tone appeared throughout the track. Effects remained quite minor throughout the film, as they were restricted to quiet ambience for the most part. These also showed some excessive brightness, but since they were such a small part of the track, this wasn’t a major concern. As with September, AW didn’t offer a true score. Instead, all of the music heard during the film came from incidental sources. Music emanated either from records or from piano playing. As with the effects, the music always remained firmly in the background. Quality generally appeared to be fine despite the modestly tinny tone that affected much of the sound. For the most part, the soundtrack of Another Woman worked acceptably well for its material, but the fidelity was a little weaker than I’d expect. Apparently Woody Allen doesn’t care for DVD extras, which is why none of the DVDs for his films include many. That is also the case for Another Woman. All we find are some moderately interesting production notes within the four-page booklet and also the movie’s theatrical trailer. While Another Woman isn’t the worst of Woody Allen’s dramatic films, that doesn’t mean it’s an interesting experiment. The movie suffers from the same narcissistic monotony that marred the others, and it presents a portentous journey into boredom. The DVD presented fairly weak picture plus adequate sound and almost no extras. In the end, the fairly poor quality of the disc combined with the dreary nature of the film makes it one to avoid. Note: Another Woman can be purchased on its own or as part of the Woody Allen Collection 1987-1992. The latter also includes September, Crimes and Misdemeanors, Alice and Shadows and Fog. Unlike packages such as The Oliver Stone Collection or The New Stanley Kubrick Collection, 1987-1992 tosses in no exclusive extras, but its list price of $83.96 is about 16 percent off of the separate cost of all five movies. As such, it would be a nice bargain for anyone who wants all of the different films.